It seems turning 40 is ‘the new black’ for a range of other age groups – just take your pick! Yet when test driving this mint 40-year-old Mercedes-Benz O305 Mark 1-1923 from the Sydney Bus Museum she still feels in the prime of her life. Forty and fabulous? Absolutely! At a recent visit to the Sydney Bus museum this Mercedes-Benz 0305 Mark 1-1923 was chosen for a test drive out of the collection there for two reasons. We’d seen the Mercedes last year at Sydney Bus Show and thought it was in amazing condition – plus nostalgia took over. The Mercedes was initially allocated to Kingsgrove and Tempe depots, where they had 49 of them in 1978. It operated there until the early 1990s, before becoming an early withdrawal. Being in such perfect running order, we asked Andrew Chechlacz, operations manager at the Sydney Bus Museum, what the Mercedes is usually used for. "A couple of weeks ago Transport NSW used it in the Sydney Mardi Gras parade. The reason they picked that bus was that it was built in 1978 and that’s the year the Mardi Gras began, so it was a 40-year celebration," he explained. He added: "It came to us in good condition; the guys at Kingsgrove did it up for us and the Bus Union paid for it to be repainted in its original colours. It goes like a rocket and when you drive it, it’s hard to imagine it is a museum piece. I think it could put a few new buses to shame being a powerful 11.1-litre. For a 40-year old bus it goes very well." 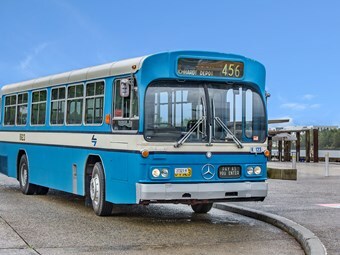 What makes this bus special and unique is the livery it’s painted in – it was unique to the Mark 1 Mercedes. It’s an overall blue with a bit of white lining, which, apart from being smart-looking, is also a representative of the first Mercedes-Benz buses when they changed from a British-base chassis to European base. The first thing you notice when you drive the Mercedes is the power with an 11.1-litre Mercedes-Benz six-cylinder diesel. This bus certainly has ‘get up and go’ with a solid 200hp. The one thing that was really impressive was the power steering; at any speed you could steer this old girl with one hand. Even at slow speed on full lock the pump didn’t struggle or lag – it always applied the right pressure. Visibility was surprisingly good. There are plenty of mirrors for both good internal and external viewing. The glass area visibility was also unexpected as sometimes the older vehicles have limited visibility for driver and passengers. There were no issues with blind spots and obviously the Mark 1 is a very good example of workmanship and design for its era. Internal noise was surprisingly better than expected. Being a rear-mount engine from a driver’s perspective, it was good. The naughty kids sitting down the rear might have a different experience, though. The 1923 has dual-circuit air brakes with a spring-applied parking brake and, after driving for a short time, you get to feel how much pressure to apply to them. Yes, it’s a bit more foot pressure than a modern system, but it was a really wet day during our photoshoot and it didn’t take long to adjust and feel super confident with them even in the poor conditions. Going up and down the gears with the Mercedes-Benz W3D 080 automatic transmission was super smooth; there was no jerking and it seemed to know what gear to be in. The’ refurb’ of this bus has been done impeccably. It really was a pleasure to be in. All of the original signage and details are amazing: the chrome bezels around the tail-lights and the Mercedes-Benz badging – every small detail is intact. For many families back in the day who didn’t own a car, they’d catch buses just like this one every day. Driving one now, you could easily feel like an excited kid back in 1978 waiting with your family on Parramatta Road to hop on board. The museum records show that the 1923 was withdrawn from service on January 10, 1992, with 580,00km on the speedo. For 1978, the Mercedes guys really had this bus down to a fine art when it was built, giving a truly nostalgic and impressive historical drive today. Our nostalgia expectations were well and truly met. A visit to the Sydney Bus Museum is a must for any bus enthusiast. This collection of impeccably restored historic vehicles displayed in the Old Tram Depot at Leichardt is more than just old buses. It’s our industry’s history curated and preserved by a team of long-serving, dedicated and proud bus historians. At our photoshoot, it was a re-visit to buses of our childhood and an opportunity to be the driver not the passenger this time. We had the pleasure to speak with several volunteers on the day; the dedication and passion for the museum was quite remarkable. Many of them were quietly spoken but emotional as they explained their work and what it meant to them. Chechlacz passionately recounted how the museum started: "Originally, the Historic Commercial Vehicle Association was formed in 1964 by a group of enthusiasts that were interested in buses and trucks. In 1986 they were granted a lease over the old train depot at Tempe to set up a museum and it’s developed from there. "In 2010, State Transit advised us that they needed the property back from Metro Bus Depot, so after some negotiations we moved here to the Old Tram Depot at Leichardt. After a few delays we opened to the public in 2016". "Essentially, we run the museum like a professionally run bus company and I am the operations manager," Chechlacz said. "We arrange all the events; we run a regular Sunday service for our visitors from the Museum to the Queen Victoria Building in Sydney. "We do a lot of outside events such as Australia Day in the city, the transport heritage event at Central Station, which is over the Queen’s Birthday long weekend, and the Shannon’s Easton Creek Classic at the racetrack – plus many other different community events as well. "We carry several thousand passengers over these events," Chechlacz added. When you think of a museum you think of displays that just need to be cleaned and maintained, but there is a lot more to keeping this place operating from what we learned. Chechlacz said, "We have a workshop section that looks after the buses that are maintained even though they’re on historical plates. We still inspect them twice a year – the same as any heavy vehicle. We basically follow the same procedures for all of the buses that are in our collection. "Out of the 70 buses in the collection there are 50 buses housed here; the other 20 are kept at outside locations. Out of that 50, there are about 30 that are registered for use." "You’re probably aware by 2022 all buses have to be low-floor accessible, which means that a lot of the buses still around now and are going to go for scrap because there’s no market for them. So we’re trying to grab a few more now because if we don’t get them they’ll be gone forever. The problem is there is no market for the high-floor buses now," Chechlacz said. The museum has a storage facility at Marsden Park that can only take single-deckers, so they rotate the exhibits around from here at Leichardt to Marsden Park every couple of months to refresh the displays. Space is a real problem for the growing collection, though. Actually, if there are any operators that have undercover accommodation and are passionate about old buses the museum would be very interested to hear from you. It could be a great showpiece for your business; who knows? "I have 42 years in the bus industry; 18 years with State Transit, where I was involved in scheduling and planning," Chechlacz said. "Then I was operations manager at Bankstown Bus Service for 12 years, followed by a few different roles until I retired two years ago. But I have been here at the museum for over 30 years." Impressive stuff for sure, we say! Working with so many great buses, did Chechlacz have a favourite in the fleet? "It’s very hard [to choose]. I like the Routemaster; it’s a brilliantly designed bus for both the driver and passengers. Another favorite of mine is the Leyland Titan OPD2/1-2033 – at the moment its being refurbished and having an engine rebuild. 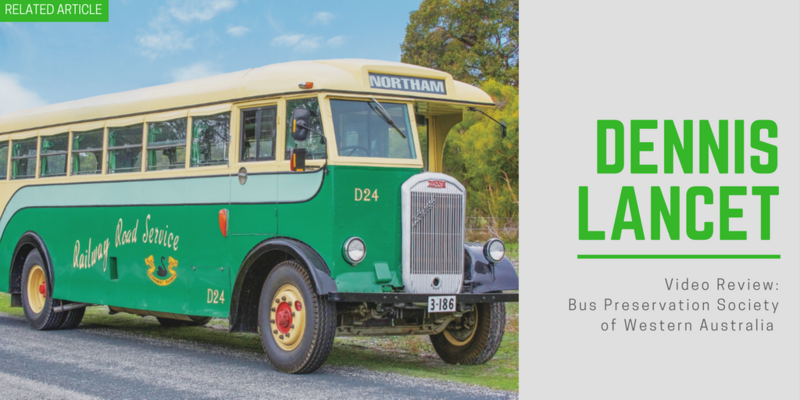 The Leyland bus started its life at the nearby Burwood Depot in 1948 and has the synchromesh gearbox, it’s a great bus." "A large proportion of the people involved are from the bus industry, but we’ve got people from other walks of life that are here. Ex-Telecom people, IT people and our financial manager, Phil Stanton, he’s been the director of a few companies and he’s made quite a significant contribution to the place," Chechlacz explained. "We’ve got other guys that have engineering backgrounds, all sorts of people. "Our oldest members are in their eighties and, surprisingly, we have quite a few younger members coming through at the moment. Many of them come because they are interested in the more modern-day buses, but when they get here and start driving the older buses it opens up a new world for them. I am quite confident we have a secure future with these younger recruits. We have guys as young as 16, so we have a very broad age group." So financially how does the museum keep going? Chechlacz explains they manage to keep their heads above water as they are more fortunate than some other museums, where they can actually take their exhibit out to the people and events. "We also hire out the buses for TV commercials and films," Chechlacz said. "Our buses have recently featured in Love Child on Channel Nine, A Place Called Home on Channel Seven and we featured in a recent Mel Gibson war movie. "We can’t do charter work as we are not an accredited operator, but we take many thousands of passengers on board for community events. "For some funding we rely on government grants, but most funding usually comes from the events we hold and the shop here at the museum. We have to earn our money to fund our restorations," he added. When asked if the museum purchases buses or gets most via donations, Checklacz says they prefer donations as they can’t set precedence for purchasing older vehicles. "State Transit, when they remove a particular bus from operation, will always offer us one. Some private companies also donate [to us]. We had Westbus donate a great Volvo; Forrest Coachlines donated a Volvo as well; and our most recent acquisition was a Busways Mercedes-Benz, which they did up very nicely for us. There is also the Perrett’s Bedford – that’s another great donation. These donations help keep our work alive". The work the volunteers do at the museum is important for both the community and the people of Sydney. So what does Checklacz enjoy most about his role? "I think I can answer that by it’s a lot of hard work and sometimes you wonder whether it’s all worth it, but at the end of the day when visitors come in and it puts a smile on their face I think that makes it all worthwhile," Checklacz responded. "What’s interesting is that visitors are always quite surprised at the size of the collection. That’s not what they expected; they expected an old shed with a few buses, but the building and the bus collections are very impressive," he added. All bus enthusiasts and industry workers are encouraged to come see the great work being done at the Sydney Bus Museum. It’s open on the first and third Sundays of every month and admission includes unlimited bus rides from the museum to the Queen Victoria Building (QVB). It’s about a 30-minute ‘round trip, but you can get off in Sydney, have some lunch, then return – and they usually have a double-decker running, which is extremely popular. Body: Pressed Metal Corp with a VOV- designed body (prototype for the Mark II).